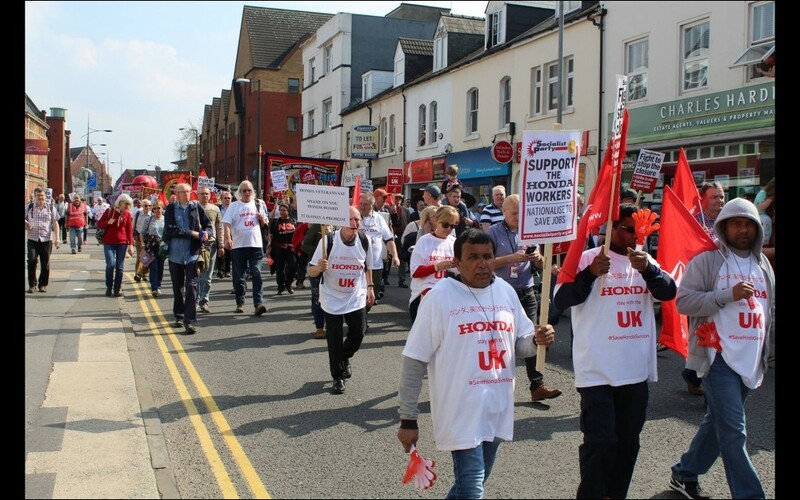 Over 2,000 people marched in Swindon on 30 March in protest at Honda's plan to close its plant in the town. If the closure goes ahead it would be devastating for jobs in the area, and throughout the large supply chain, but the workers are in no mood to let that happen. Speaking to the Socialist ahead of the demo the Unite the Union convener for the factory, Paddy Brennan, said: "It doesn't matter what job you do or what union you're in. If our plant closes, everyone will be affected. "We have to send a message to these multinational companies that you can't just pack up and leave and devastate our communities. We've got no choice but to fight. "There are many others in manufacturing in our position. Hopefully, our fight will galvanise others to do the same." Workers from the plant were joined on the march by supporters from across the country. Leading union reps from other Honda sites in Europe such as Ghent in Belgium also fear for the future of their jobs and made the trip over to show their support. The numbers on the march swelled as it passed through the town centre and passers-by joined in. Others on the side of the street stopped to applaud the march. One former Honda worker, Brendan, told us that, as well as having worked at the plant himself, three members of his family currently do. 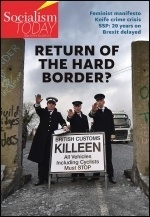 He said: "Well they bailed out the banks, so why can't the government help us?" 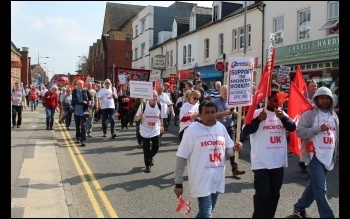 Speaking at the starting rally the general secretary of the Honda workers' union Unite, Len McLuskey, summed up the fighting mood: "If they think we're gonna simply lie down and allow them to walk all over us then they best think again." He went on to explain how it was possible to save the plant and that the "world class workforce" in Swindon had "delivered a fantastic profit" for Honda over the last 35 years. He finished by saying that it was just the start of the campaign and stating his confidence that it would end in victory. Government representatives will be joining union negotiators in a delegation to meet Honda management in Japan. The government needs to be seen to be supportive, but the Tories will not take the action needed to save jobs without a struggle that can force them to act. The Socialist Party's call for nationalisation of the plant under democratic workers' control went down well. 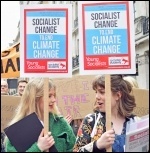 Our leaflets were read eagerly by both workers and onlookers and over a hundred copies of the Socialist were sold.